How does methanol as a mobile phase solvent impact peptide purification by reversed-phase flash chromatography? Recently there has been substantial motivation to consider and evaluate alternative, more environmentally friendly solvents. Some countries have even gone so far as to ban some of the more toxic, yet commonly used solvents. In addition to general toxicity, additional consideration in the green chemistry movement is the volume of solvent used in any particular application. In this regard, purification solvent selection is closely monitored as they are often used in large quantities. One alternative that is growing in popularity is the use of methanol in place of acetonitrile for reversed phase purification of small molecules. Methanol is certainly less expensive, but is also a more environmentally-friendly solvent for use in purification applications. But it’s use for peptide purification has not been widely adopted to date. In today’s post, I’ll compare the purification efficiency of methanol when compared to acetonitrile for peptide purification by reversed phase flash chromatography. Acetonitrile (MeCN) has historically been the mobile phase organic solvent of choice when purifying peptides. The polarity is such that peptides are still fully solubilized, yet eluted from the reversed phase stationary phase of interest. Importantly though, it is miscible with water and the solution is thin enough (think lower system back pressure) to make it amenable to purifications with higher flow rates. But is there an alternative? As I mentioned above, methanol (MeOH) is growing in popularity as the organic mobile phase solvent of choice for small molecule purifications by flash chromatography. Since I think at this point we’ve established that flash chromatography is a viable technique for peptide purification, why not use methanol for peptides as well? MeOH and MeCN fall into different polarity classes, which in turn affects their selectivity profiles. To test out this hypothesis, I dissolve about 30 mg of some crude ACP (65-74) I had in the fridge in DMSO and injected it onto a pre-equilibrated 10 g Biotage® SNAP Bio C18 cartridge. 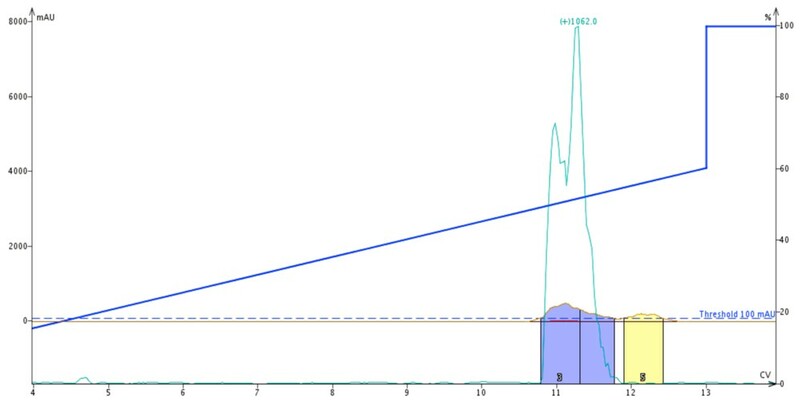 I used the standard gradient I have developed for this peptide, running from 10 to 50% MeCN over 10 column volumes and purified the sample using the Biotage® Isolera™ Dalton 2000, Figure 1. Figure 1. Crude ACP sample purified using MeCN as the organic mobile phase solvent. Fractions 3 and 4 were combined and concentrated for further analysis. As expected, the desired peptide product eluted at approximately 7.5 column volumes. Interestingly a late eluting peak is also resolved that I don’t typically observe for this peptide. As this isn’t the freshest of samples, I expect it’s a degradation product. Using the mass trace as guidance, I collected and combined fractions 3 and 4 for analytical HPLC analysis, Figure 2. Figure 2. Analytical evaluation of the peptide purified with MeCN as the organic mobile phase. Two significant impurities remain, a des-Val impurity as well as a trailing peak (unidentified). There does appear to be some residual trailing impurity lowering the final purity level. Also evident in the analytical HPLC is the presence of the des-Val deletion sequence. Although I have observed this deletion impurity during ACP synthesis in the past, the above gradient has usually removed it during purification. I am surprised to see it present in this sample. All in all though, this purification proceeded as I have come to expect for this peptide and this gradient. So how do things change with MeOH as the mobile phase organic solvent? Before I could begin the second purification, I re-equilibrated the column with MeOH, just to ensure that the results aren’t skewed by mixing of the two organic solvents. I then dissolved another 30 mg of crude ACP (65-74) in DMSO and injected it on the same 10 g Biotage SNAP Bio C18 cartridge. For this purification though I extended the gradient to run from 10 to 60% MeOH over 10 column volumes, Figure 3. Figure 3. Crude ACP purified with MeOH as the organic mobile phase solvent. 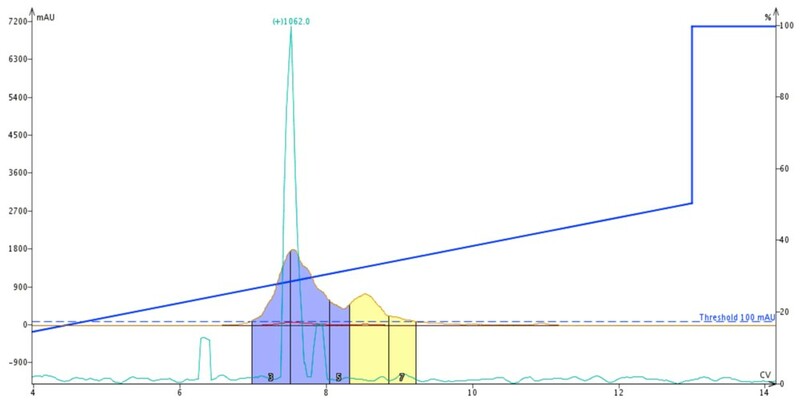 The peptide elutes later in the gradient and with a broader peak profile than that purified with MeCN. The first thing to notice is that the peptide elutes much later, at approximately 11 column volumes with MeOH as the elution solvent. Had I not extended the gradient to a higher MeOH concentration, the peptide would have eluted in the column flush and likely not been separated from any impurities. The trailing peak is still evident in this chromatography and even appears to be better resolved from the desired product with near-baseline resolution. Of note though, the product peak is less sharp and trails quite significantly when compared to the product peak shape I combined and concentrated fractions 3 and 4 for analytical HPLC analysis, Figure 4. Figure 4. Analytical evaluation of combined fractions 3 and 4 from ACP purified with MeOH. The des-Val impurity is completely absent, yet a greater proportion of the trailing peak impurity remains. As observed for the MeCN purification, there is still some residual trialing peak impurity. Despite the greater apparent resolution in the chromatography, quantification of the analytical HPLC suggests that the impurity is actually present as a greater fraction of the whole sample, decreasing the final purity. However, the des-Val impurity has been completely removed. Taken together, the purification efficiency observed for this particular peptide is roughly equivalent to that of the peptide sample purified with MeCN. One thing to note is that the elution profile was maintained (product, then trailing peak) for both organic solvents. I don’t expect this to be the case for all peptide samples moving forward. The differences in polarity between MeOH and MeCN suggest this is more of an exception, rather than the rule. This is certainly evidenced in the small molecule community where elution patterns have been demonstrated to change significantly with mobile phase organic solvent. Given these results though, I think I’ll keep using MeOH for my reversed phase peptide purifications in flash chromatography and I’ll let you know if anything weird happens! How did your peptide purification with methanol turn out?